"Ceylon" redirects here. For the time period of 1948–1972, see Dominion of Ceylon. Sri Lanka (/sriː ˈlɑːŋkə, -ˈlæŋkə/ or i/ʃriː-/; Sinhalese: ශ්‍රී ලංකා Śrī Laṃkā, Tamil: இலங்கை Ilaṅkai), officially the Democratic Socialist Republic of Sri Lanka, is an island country in South Asia near south-east India. Sri Lanka has maritime borders with India to the northwest and the Maldives to the southwest. Sri Lanka's documented history spans 3,000 years, with evidence of pre-historic human settlements dating back to at least 125,000 years. Its geographic location and deep harbours made it of great strategic importance from the time of the ancient Silk Road through to World War II. Sri Lanka was known from the beginning of British colonial rule until 1972 as Ceylon (/sᵻˈlɒn, seɪ-, siː-/). Sri Lanka's recent history has been marred by a thirty-year civil war which decisively ended when the Sri Lankan military defeated the Liberation Tigers of Tamil Eelam (LTTE) in 2009. In antiquity, Sri Lanka was known to travellers by a variety of names. According to the Mahavamsa, the legendary Prince Vijaya named the land Tambapanni ("copper-red hands" or "copper-red earth"), because his followers' hands were reddened by the red soil of the area. In Hindu mythology, such as the Mahabharata, the island was referred to as Lankā ("Island"). In Tamil, the island is referred to as Eelam. Ancient Greek geographers called it Taprobanā (Ancient Greek: Ταπροβανᾶ) or Taprobanē (Ταπροβανῆ) from the word Tambapanni. The Persians and Arabs referred to it as Sarandīb (the origin of the word "serendipity") from the word Cerentivu.Ceilão, the name given to Sri Lanka by the Portuguese Empire when it arrived in 1505, was transliterated into English as Ceylon. As a British crown colony, the island was known as Ceylon; it achieved independence as the Dominion of Ceylon in 1948. 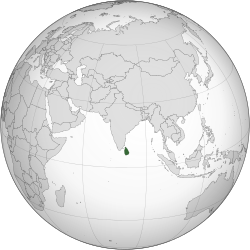 The country is known in Sinhalese as Śrī Laṃkā (Sinhalese: ශ්‍රී ලංකා) and in Tamil as Ilaṅkai (Tamil: இலங்கை, IPA: [iˈlaŋɡai]). In 1972, its formal name was changed to "Free, Sovereign and Independent Republic of Sri Lanka". Later in 1978 it was changed to the "Democratic Socialist Republic of Sri Lanka". As the name Ceylon still appears in the names of a number of organisations, the Sri Lankan government announced in 2011 a plan to rename all those over which it has authority. According to the Mahāvamsa, a chronicle written in Pāḷi, the original inhabitants of Sri Lanka are the Yakshas and Nagas. Ancient cemeteries that were used before 600BC and other signs of advanced civilization has also been discovered in Sri Lanka. Sinhalese history traditionally starts in 543 BCE with the arrival of Prince Vijaya, a semi-legendary prince who sailed with 700 followers to Sri Lanka, after being expelled from Vanga Kingdom (present-day Bengal). He established the Kingdom of Tambapanni, near modern-day Mannar. 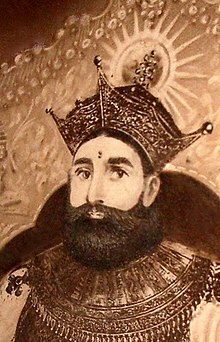 Vijaya (Singha) is the first of the approximately 189 native monarchs of Sri Lanka described in chronicles such as the Dipavamsa, Mahāvaṃsa, Cūḷavaṃsa, and Rājāvaliya (see list of Sinhalese monarchs). Sri Lankan dynastic history ended in 1815 CE, when the land became part of the British Empire. The Avukana Buddha statue, a 12 metres (39 ft) tall standing Buddha statue from the reign of Dhatusena of Anuradhapura, 5th century. The Anuradhapura Kingdom was established in 380 BCE during the reign of Pandukabhaya of Anuradhapura. Thereafter, Anuradhapura served as the capital city of the country for nearly 1,400 years. Ancient Sri Lankans excelled at building certain types of structures (constructions) such as tanks, dagobas and palaces. Society underwent a major transformation during the reign of Devanampiya Tissa of Anuradhapura, with the arrival of Buddhism from India. In 250 BC, Mahinda, the son of the Mauryan Emperor Ashoka and a bhikkhu (Buddhist monk) arrived in Mihintale carrying the message of Buddhism. His mission won over the monarch, who embraced the faith and propagated it throughout the Sinhalese population. Sri Lanka first experienced a foreign invasion during the reign of Suratissa, who was defeated by two horse traders named Sena and Guttika from South India. The next invasion came immediately in 205 BC by a Chola king named Elara, who overthrew Asela and ruled the country for 44 years. Dutugemunu, the eldest son of the southern regional sub-king, Kavan Tissa, defeated Elara in the Battle of Vijithapura. He built Ruwanwelisaya, the second stupa in ancient Sri Lanka, and the Lovamahapaya. 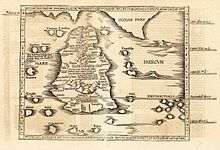 Ptolemy's world map of Ceylon, first century CE, in a 1535 publication. The Fourth Buddhist council of Theravada Buddhism was held at the Anuradhapura Maha Viharaya in Sri Lanka under the patronage of Valagamba of Anuradhapura in 25 BCE. The council was held in response to a year in which the harvests in Sri Lanka were particularly poor and many Buddhist monks subsequently died of starvation. Because the Pāli Canon was at that time oral literature maintained in several recensions by dhammabhāṇakas (dharma reciters), the surviving monks recognized the danger of not writing it down so that even if some of the monks whose duty it was to study and remember parts of the Canon for later generations died, the teachings would not be lost. Frescoes on the Sigiriya rock fortress in Matale District, 5th century. Sri Lanka was the first Asian country known to have a female ruler: Anula of Anuradhapura (r. 47–42 BCE). Sri Lankan monarchs undertook some remarkable construction projects such as Sigiriya, the so-called "Fortress in the Sky", built during the reign of Kashyapa I of Anuradhapura, who ruled between 477 and 495. The Sigiriya rock fortress is surrounded by an extensive network of ramparts and moats. Inside this protective enclosure were gardens, ponds, pavilions, palaces and other structures. Ancient Sri Lanka was the first country in the world to establish a dedicated hospital, in Mihintale in the 4th century. It was also the leading exporter of cinnamon in the ancient world. It maintained close ties with European civilisations including the Roman Empire. For example, Bhatikabhaya (22 BCE – 7 CE) sent an envoy to Rome who brought back red coral, which was used to make an elaborate netlike adornment for the Ruwanwelisaya. In addition, Sri Lankan male dancers witnessed the assassination of Caligula. When Queen Cleopatra sent her son Caesarion into hiding, he was headed to Sri Lanka. The medieval period of Sri Lanka begins with the fall of Anuradhapura Kingdom. 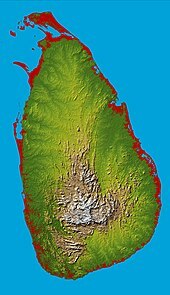 In AD 993, the invasion of Chola emperor Rajaraja I forced the then Sri Lankan ruler Mahinda V to flee to the southern part of Sri Lanka. Taking advantage of this situation, Rajendra I, son of Rajaraja I, launched a large invasion in AD 1017. Mahinda V was captured and taken to India, and the Cholas sacked the city of Anuradhapura. Subsequently, they moved the capital to Polonnaruwa. Sri Lanka's irrigation system was extensively expanded during the reign of Parākramabāhu the Great (AD 1153–1186). This period is considered as a time when Sri Lanka was at the height of its power. He built 1470 reservoirs – the highest number by any ruler in Sri Lanka's history – repaired 165 dams, 3910 canals, 163 major reservoirs, and 2376 mini-reservoirs. His most famous construction is the Parakrama Samudra, the largest irrigation project of medieval Sri Lanka. Parākramabāhu's reign is memorable for two major campaigns – in the south of India as part of a Pandyan war of succession, and a punitive strike against the kings of Ramanna (Myanmar) for various perceived insults to Sri Lanka. After his demise, Sri Lanka gradually decayed in power. In AD 1215, Kalinga Magha, a South Indian with uncertain origins, identified as the founder of the Jaffna kingdom, invaded and captured the Kingdom of Polonnaruwa. He sailed from Kalinga 690 nautical miles on 100 large ships with a 24,000 strong army. Unlike previous invaders, he looted, ransacked, and destroyed everything in the ancient Anuradhapura and Polonnaruwa Kingdoms beyond recovery. His priorities in ruling were to extract as much as possible from the land and overturn as many of the traditions of Rajarata as possible. His reign saw the massive migration of native Sinhalese people to the south and west of Sri Lanka, and into the mountainous interior, in a bid to escape his power. The next three centuries starting from 1215 were marked by kaleidoscopically shifting collections of kingdoms in south and central Sri Lanka, including Dambadeniya, Yapahuwa, Gampola, Raigama, Kotte, Sitawaka, and finally, Kandy. Chinese admiral Zheng He and his naval expeditionary force landed at Galle, Sri Lanka in 1409 and got into battle with the local king. Zheng He captured the local king and later released him. Zheng He erected the Galle Trilingual Inscription, a stone tablet at Galle written in three languages (Chinese, Tamil, and Persian), to commemorate his visit. The stele was discovered by S. H. Thomlin at Galle in 1911 and is now preserved in the Colombo National Museum. The Kingdom of Kandy was the last independent monarchy of Sri Lanka. In 1595, Vimaladharmasurya brought the sacred Tooth Relic – the traditional symbol of royal and religious authority amongst the Sinhalese – to Kandy, and built the Temple of the Tooth. In spite of on-going intermittent warfare with Europeans, the kingdom survived. Later, a crisis of succession emerged in Kandy upon king Vira Narendrasinha's death in 1739. He was married to a Telugu-speaking Nayakkar princess from South India and was childless by her. British appointed Kandyan chiefs, 1905. The formal ceremony marking the start of self-rule, with the opening of the first parliament at Independence Square. Sirimavo Bandaranaike, the widow of Bandaranaike, took office as prime minister in 1960, and withstood an attempted coup d'état in 1962. During her second term as prime minister, the government instituted socialist economic polices, strengthening ties with the Soviet Union and China, while promoting a policy of non-alignment. In 1971, Ceylon experienced a Marxist insurrection, which was quickly suppressed. In 1972, the country became a republic named Sri Lanka, repudiating its dominion status. Prolonged minority grievances and the use of communal emotionalism as an election campaign weapon by both Sinhalese and Tamil leaders abetted a fledgling Tamil militancy in the north during the 1970s. The policy of standardisation by the Sirimavo government to rectify disparities created in university enrolment, which was in essence an affirmative action to assist geographically disadvantaged students to obtain tertiary education, resulted in reducing the proportion of Tamil students at university level and acted as the immediate catalyst for the rise of militancy. The assassination of Jaffna Mayor Alfred Duraiyappah in 1975 by the Liberation Tigers of Tamil Eelam (LTTE) marked a crisis point. Forty thousand Tamil civilians may have been killed in the final phases of the Sri Lankan civil war, according to an Expert Panel convened by UN Secretary General Ban Ki-moon. The exact number of Tamils killed is still a speculation that needs further study. Following the LTTE's defeat, the Tamil National Alliance, the largest Tamil political party in Sri Lanka, dropped its demand for a separate state in favour of a federal solution. The final stages of the war left some 294,000 people displaced. 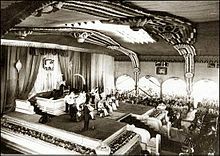 During Sri Lanka's 68th national independence day celebrations on 4 February 2016, the Tamil version of the national anthem Sri Lanka Matha was sung for the first time since 1949 at an official government event, the independence day celebrations. Lifting of the unofficial ban on the Tamil version had been approved by President Maithripala Sirisena (who had said he would unite the nation after the nearly 26-year civil war that ended in 2009) and by others in the government. This step was viewed as part of the plan for reconciliation. Other steps are also being taken to mend ethnic divisions between the Sinhalese majority and the Tamil minority, according to a November 2016 article in National Geographic. Naturally, Sri Lanka Matha was also sung in the majority Sinhalese. Some groups, and Sri Lanka's former President Mahinda Rajapaksa, were opposed to the government officially allowing the Tamil version to be sung. Sri Lanka lies on the Indian Plate, a major tectonic plate that was formerly part of the Indo-Australian Plate. It is in the Indian Ocean southwest of the Bay of Bengal, between latitudes 5° and 10°N, and longitudes 79° and 82°E. Sri Lanka is separated from the Indian subcontinent by the Gulf of Mannar and Palk Strait. According to Hindu mythology, a land bridge existed between the Indian mainland and Sri Lanka. It now amounts to only a chain of limestone shoals remaining above sea level. Legends claim that it was passable on foot up to 1480 AD, until cyclones deepened the channel. Portions are still as shallow as 1 metre (3 ft), hindering navigation. The island consists mostly of flat to rolling coastal plains, with mountains rising only in the south-central part. The highest point is Pidurutalagala, reaching 2,524 metres (8,281 ft) above sea level. The climate is tropical and warm, due to the moderating effects of ocean winds. Mean temperatures range from 17 °C (62.6 °F) in the central highlands, where frost may occur for several days in the winter, to a maximum of 33 °C (91.4 °F) in other low-altitude areas. Average yearly temperatures range from 28 °C (82.4 °F) to nearly 31 °C (87.8 °F). Day and night temperatures may vary by 14 °C (25.2 °F) to 18 °C (32.4 °F). Sri Lanka is the oldest democracy in Asia. The Donoughmore Constitution, drafted by the Donoughmore Commission in 1931, enabled general elections with adult universal suffrage (universal adult voting) in the country. It was the first time a non-white country within the empires of Western Europe was given one man, one vote and the power to control domestic affairs. The first election under the universal adult franchise, held in June 1931, was for the Ceylon State Council. Sir Don Baron Jayatilaka was elected as Leader of the House. With the constitutional reforms of 1972, the All Ceylon Tamil Congress (ACTC) and Illankai Tamil Arasu Kachchi (ITAK) created a common front called the Tamil United Front (later Tamil United Liberation Front). Following a period of turbulence as Tamil militants rose to power in the late 1970s, these Tamil political parties were succeeded in October 2001 by the Tamil National Alliance. Janatha Vimukthi Peramuna, a Marxist-Leninist political party founded by Rohana Wijeweera in 1965, serves as a third force in the current political context. It endorses leftist policies which are more radical than the traditionalist leftist politics of the LSSP and the Communist Party. Founded in 1981, the Sri Lanka Muslim Congress is the largest Muslim political party in Sri Lanka. The Supreme Court of Sri Lanka, Colombo. A locally built Unibuffel MK II Armored Personnel Carrier of the Sri Lanka Army. Since independence in 1948, the primary focus of the armed forces has been internal security, crushing three major insurgencies, two by Marxist militants of the JVP and a 30-year-long conflict with the LTTE which has been proscribed as a terrorist organisation by 32 countries. The armed forces have been in a continuous mobilised state for the last 30 years. Marking a rare occurrence in modern military history, the Sri Lankan military was able to bring a decisive end to the Sri Lankan Civil War in May 2009. Sri Lanka has claimed to be the first country in the modern world to eradicate terrorism on its own soil. The Sri Lankan Armed Forces have engaged in United Nations peacekeeping operations since the early 1960s, contributing forces to permanent contingents deployed in several UN peacekeeping missions in Chad, Lebanon, and Haiti. In the 19th and 20th centuries, Sri Lanka became a plantation economy, famous for its production and export of cinnamon, rubber and Ceylon tea, which remains a trademark national export. The development of modern ports under British rule raised the strategic importance of the island as a centre of trade. From 1948 to 1977 socialism strongly influenced the government's economic policies. Colonial plantations were dismantled, industries were nationalised and a welfare state established. In 1977 the Free market economy was introduced to the country, incorporating privatisation, deregulation and the promotion of private enterprise. As of 2010[update], the service sector makes up 60% of GDP, the industrial sector 28%, and the agriculture sector 12%. The private sector accounts for 85% of the economy. India is Sri Lanka's largest trading partner. Economic disparities exist between the provinces, with the Western province contributing 45.1% of the GDP and the Southern province and the Central province contributing 10.7% and 10%, respectively. With the end of the war, the Northern province reported a record 22.9% GDP growth in 2010. Sri Lanka's road network consists of 35 A grade highways and two Controlled-access highways (E01)and(E03). The railway network, operated by the state-run national railway operator, Sri Lanka Railways, spans 1,447 kilometres (900 mi). Sri Lanka also has three deep-water ports, at Colombo, Galle, and Trincomalee, in addition to the newest port being built at Hambantota. The port at Trincomalee is the fifth largest natural harbour in the world: during World War II the British stated that they could place their entire navy in the harbour with room to spare. Sri Lanka's flag carrier airline is SriLankan Airlines. Fitch Ratings has affirmed Sri Lanka's Foreign- and Local-Currency Issuer Default Ratings (IDRs) at 'BB-' with a "stable" outlook. With a grant of 20 million dollars from the US and help from China, a space academy has been set up for the purpose of developing an indigenous space sector to launch satellites of other nations as well as of Sri Lanka. This dual use of launching technology will also serve to develop missile technology. On 26 September 2012 China launched Sri Lanka's first satellite, with plans for more launches in the coming years. During the past few years, the country's debt has soared as it was developing its infrastructure to the point of near bankruptcy which required a bailout from the International Monetary Fund (IMF). "Without an IMF loan, Sri Lanka would have been in a precarious position," in May 2016 according to Krystal Tan, an Asia economist at Capital Economics who added that "foreign exchange reserves only covered around 80 percent of short-term external debt". The IMF had agreed to provide a US$1.5 billion bailout loan in April 2016 after Sri Lanka provided a set of criteria intended to improve its economy. By the fourth quarter of 2016 the debt was estimated to be $64.9 billion. Additional debt had been incurred in the past by state-owned organizations and this was said to be at least $9.5 billion. Since early 2015, domestic debt increased by 12 percent and external debt by 25 percent. Sri Lanka is the 57th most populated nation in the world, with 20,277,597 people, and an annual population growth rate of 0.73%. Sri Lanka has a birth rate of 17.6 births per 1,000 people and a death rate of 6.2 deaths per 1,000 people. Population density is highest in western Sri Lanka, especially in and around the capital. Sinhalese constitute the largest ethnic group in the country, with 74.8% of the total population. Sri Lankan Tamils are the second major ethnic group in the island, with a percentage of 11.2. Sri Lankan Moors comprise 9.2%. Tamils of Indian origin were brought into the country as indentured labourers by British colonists to work on estate plantations. Nearly 50% of them were repatriated following independence in 1948. They are distinguished from the native Tamil population that has resided in Sri Lanka since ancient times. There are also small ethnic groups such as the Burghers (of mixed European descent) and Malays from Southeast Asia. Moreover, there is a small population of Vedda people who are believed to be the original indigenous group to inhabit the island. The distribution of languages and religious groups in Sri Lanka, 1981. Sri Lanka is a multi-religious country. Buddhists comprise 70 percent of the population, with the Theravada school being predominant. Most Buddhists are of the Sinhalese ethnic group. Buddhism was introduced to Sri Lanka in the 2nd century BC by Venerable Mahinda. A sapling of the Bodhi Tree under which the Buddha attained enlightenment was brought to Sri Lanka during the same time. The Pali Canon (Thripitakaya), having previously been preserved as an oral tradition, was first committed to writing in Sri Lanka around 30 BC. Sri Lanka has the longest continuous history of Buddhism of any predominately Buddhist nation, with the Sangha having existed in a largely unbroken lineage since its introduction in the 2nd century BC. During periods of decline, the Sri Lankan monastic lineage was revived through contact with Thailand and Burma. Buddhism is given special recognition in the Constitution which requires Sri Lankans to "protect and foster the Buddha Sasana". Islam is the third most dominant religion in the country, having first been brought to the island by Arab traders over the course of many centuries, starting around the 7th century AD. Most Muslims are Sunni who follow the Shafi'i school. Most followers of Islam in Sri Lanka today are believed to be descendants of these Arab traders and the local women they married. Hindu devotees engaging in Kavadi at a temple in Vavuniya. Sri Lankan rice and curry. A Low Country drummer playing the traditional Yak Béra. Sri Lankans have won two medals at Olympic Games, one silver, by Duncan White at 1948 London Olympics for men's 400 metres hurdles and one silver by Susanthika Jayasinghe at 2000 Sydney Olympics for women's 200 metres. In 1973, Mohammed Lafir won the World Billiards Championship, the highest feat by a Sri Lankan in a Cue sport.Sri Lanka has also won the Carrom World Championship titles twice in 2012 and 2016 Aquatic sports such as boating, surfing, swimming, kitesurfing and scuba diving on the coast, the beaches and backwaters attract a large number of Sri Lankans and foreign tourists. There are two styles of martial arts native to Sri Lanka, Cheena di and Angampora.